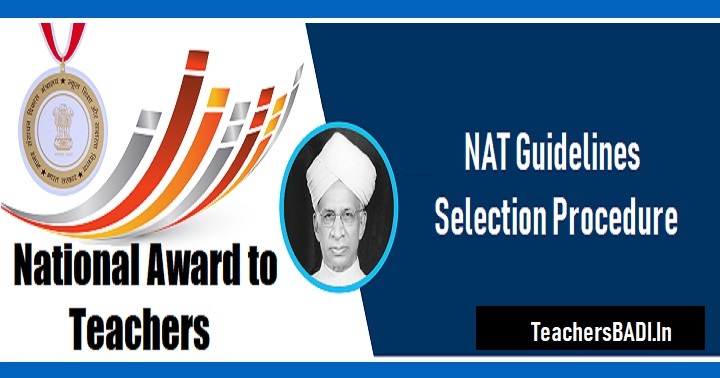 #National #Award to #Teachers 2017-2018: National Best Teacher Awards Guidelines and Scheme Procedure-Application Form-Best teachers selection for National award 2017, National best teachers, #ts #ap nat scheme guidelines procedure: NAT Government of India, Ministry of Human Resource Development, Department of School Education and Literacy has given a circular to Principal Secretaries / Secretaries (Education) of all the States/ UTs and Heads of Organizations. Subject: National Award to Teachers, 2017 - Allocation of Awards to States/Union Territories I Organisations - Request for recommendation. The Government of India, Ministry of Human Resource Development, Department of School Education & Literacy implements a Scheme of 'National Award to Teachers' as per which teachers from all over the country are selected for National Awards. All the applications would be received through an online web portal. The portal would be developed and managed by Administrative Staff College of India (ASCI) assisted by CIET, NCERT under the overall supervision of MHRD. ASCI would also ensure coordination with States/UTs regarding timely entry into the portal and resolution of technical and operational issues during data entry into portal. MHRD will bear the entire expenditure for development and maintenance of the portal. Teachers and Heads of schools themselves shall apply directly by filling the application form online through the web portal before the prescribed cut-off date. Every applicant shall submit a portfolio, online along with the Entry Form. The portfolio shall include relevant supporting material such as documents, tools, reports of activities, field visits, photographs, audios or videos etc. a) Physical verification of the facts/ information provided by the applicant by forming verification teams. b) Evaluation/ marking of the applicants as per the format at Annexure-I. d) After the detailed evaluation of the applications, DSC will shortlist 3 names and forward these to State Selection Committee through online portal along with vigilance clearance certificate of each of the 3 applicants. e) In addition to the applications received, the DSC in exceptional circumstances, may suo-moto consider name of maximum one person among the outstanding teachers including special educators and differently abled teachers/heads of schools. The evaluation will be done as per the format at Annexure-I. a) Re-verification of the facts/ information/marks of the nominations received from all the DSCs. a) The Organizations may follow their internal processes for receiving nominations. b) Evaluate all the nominations and prepare shortlist of the best candidates, subject to the maximum number allotted to the Organizations as per Annexure-II and forward the same to Independent Jury at National level through online portal. b. The jury shall select names from the list subject to the maximum of 45 (+2 Special Category for differently abled teachers etc.). d. Secretarial assistance to the Jury will be provided by NCERT. a) Schools run by State Govt./UTs Administration, schools run by local bodies, schools aided by State Govt. and UT Administration. b) Central Govt. Schools i.e. Kendriya Vidyalayas (KVs), Jawahar Navodaya Vidyalayas (JNVs), Central Schools for Tibetans (CTSA), Sainik Schools run by Ministry of Defence (MoD), Schools run by Atomic Energy Education Society (AEES). 1. Work done by teacher to encourage community, parents, alumni etc. to contribute to the school in any way e.g. physical infrastructure, computers, mid day meal, funds, books etc. 4. Is the teacher attending school regularly without any complaints? 5. Whether the teacher is regularly attending the in-service training he/she is deputed to? 6. Work done by teacher to increase enrolment and reduce dropouts. a) Mobilization of society for school infrastructure and for spreading social awareness among children.